Beginning with its settlement by refugees seeking religious freedom to its present standing as a diverse and vibrant city, New Rochelle's 325-year-old story reflects many great American trends and social movements. From a small town of farms to one of New York's leading suburbs, by the turn of the 20th century, New Rochelle was a fashionable spot from which to "drop a note." The "Golden Age of Postcards" arrived at an ideal time for the rapidly growing community, which boasted an array of winning characteristics, including 12 meandering miles of Long Island Sound shoreline, attractive neighborhoods styled as "residential parks," an up-and-coming downtown, and many impressive structures. 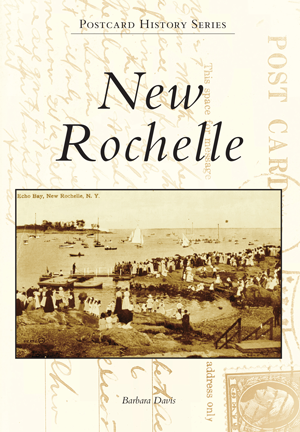 In New Rochelle, vintage postcards from the New Rochelle Public Library's local history collection provide a wonderful glimpse into the years New Rochelle's core identity took shape. Barbara Davis is the city historian of New Rochelle and community relations coordinator for the New Rochelle Public Library. She previously authored a history of the city in Arcadia Publishing's Images of America series in 2009.